Pests are organisms that are capable of harming humans, animals, plants or the environment. Pests include a variety of organisms ranging from microbes to plants to animals. Weeds and invasive plants cause harm by competing with native plants. Invasive plant species grow and reproduce rapidly, causing major changes in vegetative cover wherever they become established. Left unchecked, invasives can overtake desirable plants and significantly degrade grasslands, wetlands and woodlands. 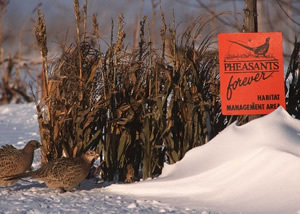 Prevention: Prevention begins with excluding new invasive species from Minnesota. Education is critical to prevention; this includes educating the public on risks of transporting pests in firewood. Early Detection: Detection surveys help find pests before they become established. Rapid Response: If an invasive pest is detected it is critical to quickly determine the extent of the infestation and contain it to limit the spread. Integrated Pest Mangement: Established plant pests result in significant economic and environmental damage each year in agronomic and horticultural crops as well as in natural and recreational areas. Losses occur from pest damage as well as from costs associated with actions taken to mitigate that damage. Integrated Pest Management is a balanced approach to pest management which incorporates the many aspects of plant health care/crop protection in ways that lessen harmful environmental impacts and protect human health by providing effective management tools for producers, land managers, governmental agencies, schools, communities and home owners. Field windbreaks are linear plantings of trees/shrubs designed to reduce wind speed in open fields, preventing soil erosion and protecting properties from wind damage. Windbreaks are typically planted in multiple rows perpendicular to prevailing winds. On the downwind side of a well-established windbreak, wind is generally slowed for a distance of 10 times the height of the trees. Old windbreaks may need renovation to function properly, including removal and replacement of selected trees/shrubs. Shelterbelts are windbreaks designed to protect households and animals from wind and blowing snow. They can also be used to protect wildlife wintering areas. One or more rows of trees/shrubs are planted around the north and west sides of the area to be protected, surrounding it partly (often in an L-shape) or more completely, like a squarish belt. Shelterbelts protect households and animals from blowing wind and also save energy. The Native Buffer Program is a voluntary program that encourages the creation of high quality shoreland and streambank buffers that protect water quality within the Little Rock Lake Watershed. A shoreland buffer is a naturally vegetated plot of land, located between the water's edge (lake, stream or wetland) and the land uphill. A shoreland buffer can be composed of a mix of native aquatic plants, grasses, wildflowers and/or shrubs and trees. Basically, it is undisturbed land at your shoreline; this means that your lakeshore would not be mowed or manicured into a sand beach. Shoreland buffers provide benefits to people, the environment, wildlife, and aquatic life. Restored vegetation at the lake's edge restores the function of the ecosystem which originally protected the lake before it was altered by humans. Some of the benefits of a buffer include: filtering of pollutants such as sediment and phosphorous out of runoff from uphill land uses, prevent shoreline erosion by holding soil in place (native plants have deep root systems), provide habitat for wildlife, deter geese from congregating on the lakeshore, and they allow for more leisure time to relax and enjoy the nature of life at the lakeshore. The Benton SWCD currently has funding available to assist Little Rock Lake (and watershed) residents with buffer design and cost-share of up to 75% of the total project cost. However, the funding is limited and available on a first come-first serve basis. Native Buffer Program contracts are for 15 years from the date the agreement is signed. Planting must be done with local ecotype seed with a goal of 25 species per site. For buffer cost-share very minimal grading is allowed. All projects are approved for cost-share by the Benton SWCD Board of Supervisors and cost-share reimbursements are provided after the project is complete. A rain garden is a colorful, perennial planting designed to capture and use rain water that may otherwise run off the land. It is a garden in a shallow depression, and can be large or small. A rain garden should not be mistaken for a wetland as they do not hold water for more than a few hours, or a day at most. This prevents them from becoming a breeding ground for mosquitoes. They capture and filter runoff from roofs, lawns, and driveways that may overload storm sewers and pollute streams and rivers. They reduce the need for supplemental waterings for your yard, which can become expensive. They grow healthy plants using high quality water in the form of rain. They provide a good mix of plants that change color, structure, shape, and form throughout the season. They provide habitat for butterflies, bees, birds, and other wildlife. The Benton Soil & Water Conservation District has various cost-share programs available for landowners to repair/replace failing septic systems. The purposes of these programs are to promote public health and welfare by preventing, reducing, and eliminating water pollution. Benton SWCD is administering this Clean Water Fund grant on behalf of Benton County. This program is available for Benton County residences who have a homesteaded, single-family home who meet the income criteria and other programs eligibility requirements. Constructed wetlands, sometimes called treatment wetlands, are man-made systems engineered to approximate the water-cleansing process of natural wetlands. Constructed wetlands can also provide habitat for some waterfowl, other birds, amphibians and invertebrates.